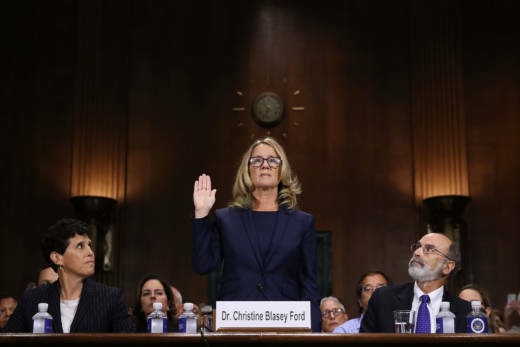 Dr. Lynn Ponton, a psychiatrist in San Francisco and a professor of psychiatry at UCSF, said she wasn't surprised when she started getting phone calls from clients on Thursday during the Blasey-Kavanaugh hearing before the Senate Judiciary Committee. And she says other Bay Area psychiatrists she's been talking with are also seeing their phones light up. "Many of my patients have experienced very significant trauma in their own lives," Ponton said. "And just watching this and having it so intensified by the media, they are being re-triggered. So they are calling me. They are having more symptoms. Some are turning to substances. Some are talking to their friends." Ponton has advice for people who are feeling upset and emotional after watching and listening to Christine Blasey Ford describe allegedly being sexually assaulted by U.S. Supreme Court nominee Judge Brett Kavanaugh, and the subsequent questioning of both Ford and Kavanaugh. Monitor your own viewing, listening and cellphone use. The vocal triggers can be especially strong with this type of hearing. So stay alert to that and protect yourself. You will know you are having symptoms if your heart rate goes up, your anxiety level increases, your thinking seems unclear. Those are all clues you are having trouble with it. Reach out to others for support. Even with a text. You might establish a group text to support one another while following the coverage. That's what Ponton did with members of her family. It's important to know others are out there you can connect with. Keep up your regular activities. Rather than stay up all night thinking you have to keep up with the coverage and staying on top of it all the way, know it's more important to get sleep and make sure to eat and exercise regularly. Keep a journal of your thoughts and feelings through these days so you can go back to them at a later point. It's a way to put them aside, and frame them so you can maybe tackle them when you have more energy. Use grounding techniques such as listening to soothing music or taking walks in nature, gardening, cooking or anything else you know can reduce your anxiety or ground you. Ponton says another group reacting to the hearings are those who are rethinking their own behavior and whether they behaved appropriately. "One of my teen patients reached out to me today already, called me about a situation that had happened a year ago with a girl in his high school. And wondered how he should handle it," Ponton said. "Should he go back and apologize to her? He's really been rethinking it. So he was stimulated by Dr. Ford's testimony." She's also been talking with older clients today. "They are looking back on their lives 30 and 40 years ago and having some very difficult thoughts about how they treated others sexually," Ponton said. "I think for many of us, men and women, we are having some of those thoughts and this brings it up for us."